Farro, a venerable relative of wheat (some say, in fact, that it was the ancestor of all other wheat varieties, or the "mother of all wheat"), was a staple of the daily diet in Ancient Rome, as well as for most of the Mediterranean and Middle East, for thousands of years. It also figured largely in the rations of the Roman legions. Today it is still popular in Tuscany and has been growing in popularity throughout the world as many people start to focus on the health benefits of whole grains over highly processed carbohydrates. It has a hearty, chewy texture and nutty flavor, and is a very healthy whole grain, high in fiber, iron and protein. It works well in salads, soups, risottos (a.k.a., "farrottos"), breakfast porridges, as a vegetable stuffing, and in pilafs. It's a bit difficult to translate "farro" into English, since this one Italian name is used to describe three different grains that have distinct names in other languages: spelt, emmer, and einkorn. 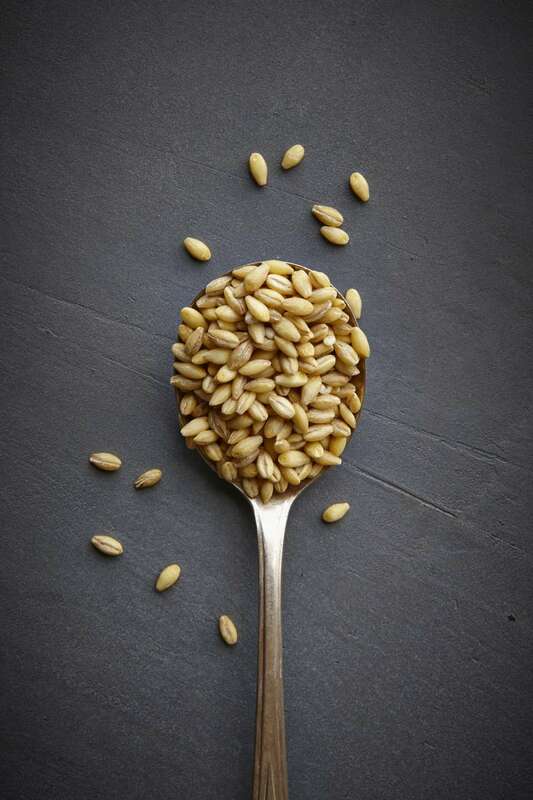 It can be used somewhat interchangeably with barley, brown rice and wheat berries in cooking, though the cooking times, technique, texture and flavor will vary. Whole-grain farro (or "farro integrale") needs to be soaked overnight before using in cooking, while the semiperlato variety, and the variety sold by Bob's Red Mill, do not, as some of the outer bran layer has been removed. to allow for faster cooking. Farro is divided into 3 grades. The best has grains 6-8 mm long (1/4 to 1/3 of an inch), the second has grains 3-5 mm long (1/8 to 1/4 inch), and the third consists of cracked grains broken during processing. If a recipe that you are following calls for cracked farro, it's preferable to purchase whole grain farro and crack it yourself by using an electric spice/coffee grinder, blender, or food processor, in order to avoid purchasing cracked grains mixed with dust or stones. Store farro like any other grain, in a sealed container in a cool, dry place. To prepare whole-grain farro (not semiperlato or perlato): Wash it well, picking out impurities such as bits of chaff, pebbles, or bad grains, and soak it for at least 8 hours. You can store it, soaking in water, in the refrigerator for a few days. It can then be used directly in a soup or simmered, covered, for 30 to 45 minutes until it reaches a firm, chewy, al dente texture. One thing that you should keep in mind is that farro will continue to absorb liquid and soften once it is done, so you should let it sit for a while after cooking. For semiperlato and perlato farro, you can skip the overnight soaking step and simmer them directly, covered, for about 15 to 30 minutes, in a 1:3 ratio of farro to water. Drain off any excess water at the end of cooking.